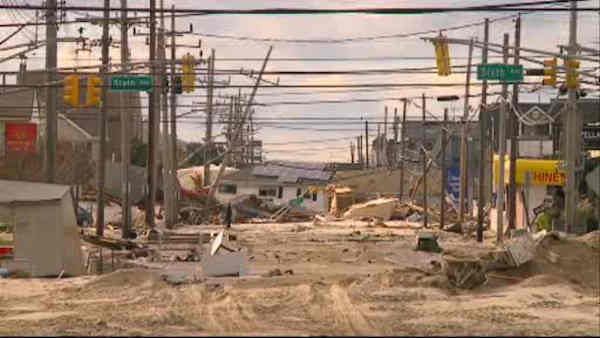 UNIONDALE -- The New York attorney general's office executed a search warrant Wednesday at a Long Island engineering firm that has been accused in civil lawsuits of submitting bogus inspection reports on homes damaged by Superstorm Sandy. Investigators worked throughout the day at the offices of HiRise Engineering in Uniondale. HiRise was one of a host of engineering companies hired after Sandy to investigate damage to buildings insured through FEMA's National Flood Insurance Program. Lawyers for several homeowners say they have uncovered documents showing that the company, and at least one other engineering firm in Louisiana, displayed a pattern of altering reports submitted by subcontractors in ways that minimized insurance payouts. HiRise officials have repeatedly denied wrongdoing and said any changes were in line with professional standards. "HiRise has a 15-year history of ethical business practices and supports FEMA's initiative to resolve" all outstanding Sandy claims, President and CEO Joe Celentano said in a statement. "We are cooperating to the fullest extent possible with all parties in an effort to address and resolve the issues that have been raised." After Sandy, HiRise hired subcontractors to inspect flooded homes and help insurers determine whether problems like sloping floors, cracked foundations or buckled walls were due to the storm surge, or other factors not covered by flood insurance, like strong winds or simple old age. Much of the evidence in the HiRise cases has revolved around a small amount of work done for the firm by one Brooklyn engineer, Harold Weinberg. Documents made public in the lawsuits reveal that supervisors at HiRise repeatedly clashed with Weinberg over quality of his work, chiding him for turning in "very vague and ambiguous" reports that were improperly formatted, lacked specifics or didn't address the key issue of whether damage was due to flooding or something else. Nearly all of his reports were changed after he turned them in. In some cases, reports that were missing key information were rewritten with much more authoritative findings, or reorganized in a way that made them easier to read. In other cases, his conclusions were discarded entirely. In one report, dated Jan. 16, 2013, Weinberg wrote the foundation walls of a small home in Brooklyn's Gerritsen Beach section had been "damaged extensively" by the storm surge. He included photographs of crumbling masonry blocks in the crawl space. But the final version turned in by HiRise said "no structural damage" was caused by the storm. It said the foundation blocks had deteriorated over time. In several reports, Weinberg's signature appears to have been cut from the original draft and clumsily pasted into the final version. Weinberg has submitted an affidavit in the civil cases saying that his signature was forged.